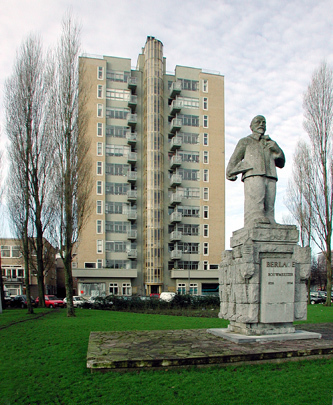 Leaving aside an early attempt by Duiker in The Hague (Nirwana-flat), this 12-storey tower block was the first high-rise housing project in the Netherlands. Its ground floor contains two shops and a porter's lodge, with two six-room apartments on each subsequent storey. Its structure, floors, stairs and balconies are all of concrete. The Skyscraper has many 'modern' conveniences such as rubbish chutes, a porter, a lift, central heating, hot water, speaking tubes and an electric bell. The public gardens in front of the building contain a statue of Berlage, the designer of Amsterdam-Zuid, by Hildo Krop dating from 1966.